Memories – my memories – are inaccurate and incomplete. But I remember a few vivid ones involving organs and lightning. The church in Wichita, Kansas where I grew up had a pretty standard two-manual electronic organ from either the late 70s or early 80s (no pipes, sadly.) Maybe the brand began with an “S”? Or maybe it didn’t. I remember being particularly annoyed that it had no MIDI interface, which feels like such a dumb concern to 2019 Adam. It also had a bench that wouldn’t adjust, necessitating some homemade two-by-fours to bring it up to a height where my legs could move about the pedals. Kansas is a severe weather Mecca, where a perfectly normal humid morning or afternoon can turn into a sick green color full of electricity. And this crummy organ was no fan of any extra electricity. I distinctly remember a few times when lightning would strike that cross atop the weird, sloped roof of St. Francis of Assisi and the current would drive straight down into the organ and it would shriek continuously. Or just die completely. Either way, a terrifying experience for someone sitting on the bench with hands atop the keys. A few days later, I’d find the organ with panels off and a whole mess of wires exposed while being repaired. It was like seeing the cotton coming out of your stuffed animal and wondering if it would be the same afterward. So tonight in Peoria, Illinois some 25 years later, I’m practicing on a small continuo pipe organ underneath the loft at Sacred Heart and I suddenly hear a tremendous crash and the lights go out and I leave my skin behind. The steeple has been hit and practice is definitely over. 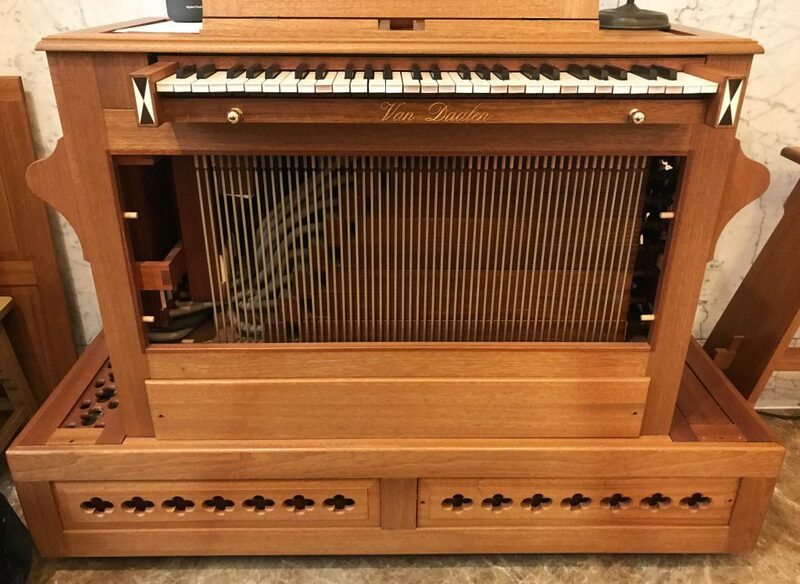 The embattled electronic organ in Kansas was replaced with a real pipe organ right around the time I moved to Illinois. Man, I would have loved learn on such an instrument. Previous Post There’s nothing else to worry about in the world.